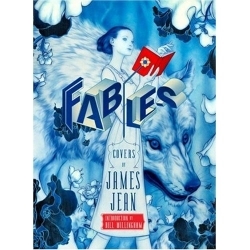 Los Angeles artist James Jean's new book of illustrated covers from the famous series "Fables" is out and about and soon to be on my book shelf. 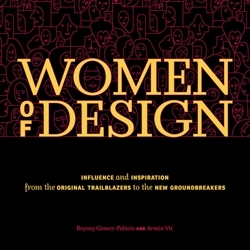 The book "Women of Design:Influence and Inspiration from the Original Trailblazers to the New Groundbreakers" from UnderConsideration founders Bryony Gomez-Palacio and Armin Vit is finally available (published by HOW Books). Maison Biscuit by Pierre Minassia, AUM. 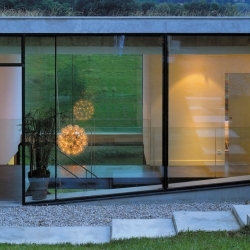 The house is located in a small village in the area of Lyon on a very steep slope and facing an open landscape. 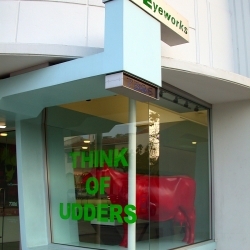 Holiday season on Main Street is not complete without humble animals and bales of hay, the l.a.Eyeworks stores on Beverly Boulevard and Melrose Avenue turns up the volume on a stable of seasonal sentiments. Antoinette J. Citizen Did an art installation of an interactive Super Mario Brothers Level 1-1 Room with working question mark boxes and bricks that would make sounds from the game. 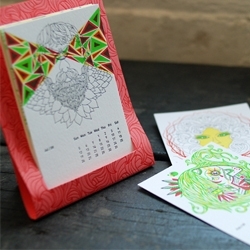 DDDDOWNLOAD is an interesting small utility that allows you to download any FFFFOUND! collection straight to your hard drive. 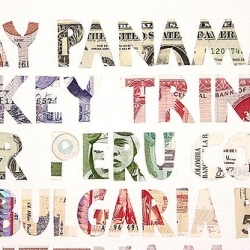 Justine Smith cuts international currency. And I don’t mean budget cuts, either. Check out the rest of her portfolio for some lovely sculptural paper work! 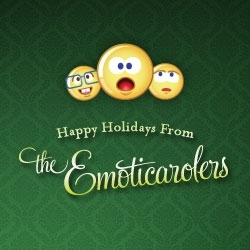 Emoticons + caroling = Emoticarolers. Rewrite the lyrics of classic holiday songs, then send the Emoticarolers off to the digital doorsteps of your friends and family. 2009 Studio On Fire Calendar. Hair&Fur theme, editioned, 4-color letterpress, tree-free100% cotton stock. 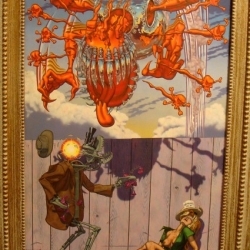 Featuring the work of artists Adam Garcia, Brian Gunderson, Rinzen, Justin Blyth, Clarimus. An impressive building for the new headquarters of the savings bank Caja Vital Kutxa in Madrid, Spain. 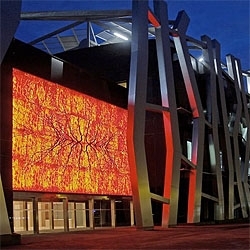 The exterior steel structure allows for large interior spans. 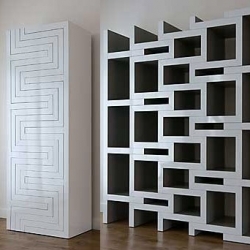 By spanish architects Mozas Aguirre Arquitectos. 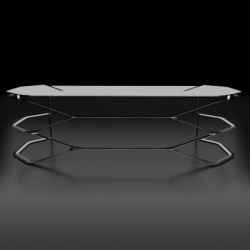 Called the Hexa and made of carbon fiber, this desk by Can Yalman is the most beautiful desk we've seen lately. 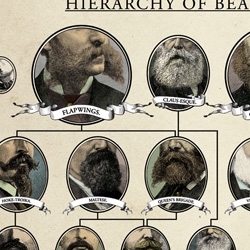 For the first time in wall-mounted form, comes this handy 18" x 24" chart tracking the hierarchy of the many types of beard that currently adorn the face of Man. From the Wondermark collection Beards of our Forefathers, just $12. 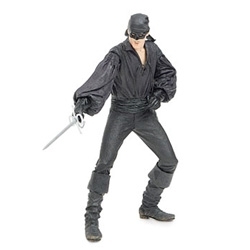 FEATUREDBack to back giveaways today! 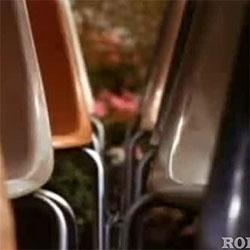 NOTCOT Holiday Giveaway #23 ~ Reform School is giving away one black viewmaster with a set of Vladmasters of your choice! Vladmaster = artistic handmade viewmaster reels! 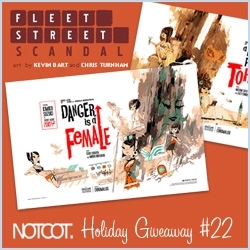 FEATUREDNOTCOT Holiday Giveaway #22: Fleet Street Scandal is giving way a full set of their 4 amazing Yuki-7 Posters! Retro espionage style with an adorable super heroine! Just got my Stendig for 2009. I love having a calendar larger than my desk that I can use for wrapping paper all year long! 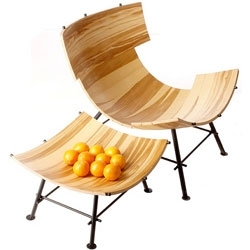 I'm really not crazy about the base, but I love the multi-colored wood and the curved shapes behind Lop Furniture's Zeeen line. FEATUREDMonkey Balls! 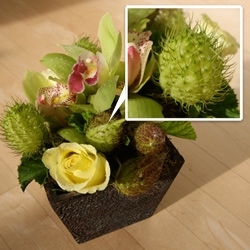 Surprise birthday floral arrangement just came, and i'm totally mesmerized by these things... what IS it? 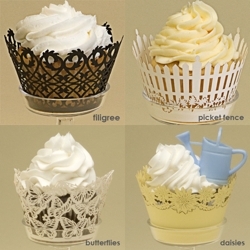 Dress up your cupcakes with these intricate detail laser cut cupcake wrappers by Paper Orchid. 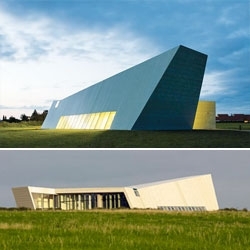 The Church of the Holy Cross is beautifully minimalist building by KHR Arkitekter in Jyllinge, Denmark. ORDOS 100 #1: ArchDaily is featuring the villas for this development in Inner Mongolia, curated by Ai Wei Wei with architects selected by Herzog & de Meuron. 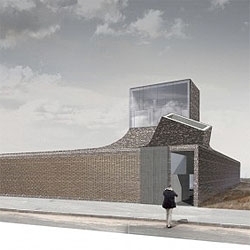 First one is the villa by chilean architect Alejandro Aravena. 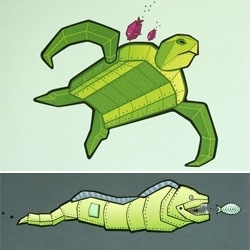 Hamburger Panda has some fun prints in her Seabots series. Beautiful porcelain bottles inspired by memories of antique bottles dug up as children. 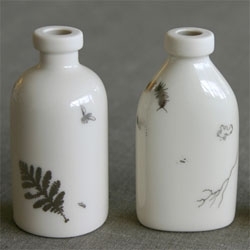 The bottles are embellished with platinum decals of insects, weeds, roots and dirt. How to build an Eames Shell Chair, a short video describing the old techniques for chair prototyping and mass production. 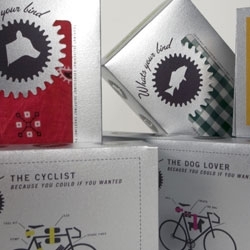 Daniel Blackman designed packaging for Biker's Band, a fictional multi-purpose bike strap company. I like the diagrams that explain the various uses of the straps. 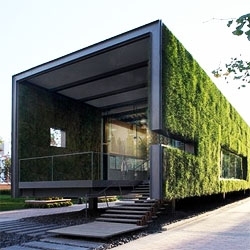 A temporary Green Showroom in Beijing by Vector Architects. With the grass walls, they literally accomplished something green. 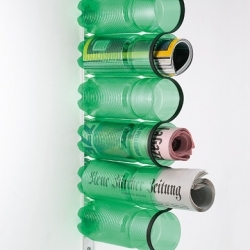 Learn 7 beautiful ways to recycle your used PET bottles. 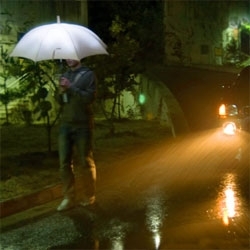 Sang-Kyun Park's LightDrops is an umbrella powered by rain - as water hits a conductive membrane that is integrated into the surface of the umbrella, energy from the impact of the raindrops is transformed into power that lights up embedded LEDs. "Alice's Adventures in Wonderland" by Ramdaq Photography. 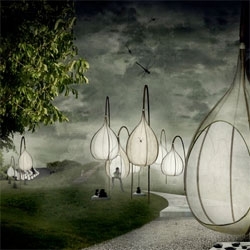 Kjellgren Kaminsky Architects' "Silent City" proposal for the 1976 Tangshan Earthquake Memorial Park in China. The swinging lanterns are dispersed throughout the park and are a contemporary interpretation of the traditional Chinese rice lamp. Art Center College of Design Product Grads have a website showcasing their work, in preparation for their upcoming Grad Show. Loving the minimalist simplicity of Gee Beauty's packaging, by GJP. Hola Ola No1 is a pre-molded soft silicone pouch that you open and close with a squeeze. 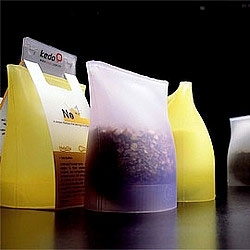 Great for spices and great looking, too! 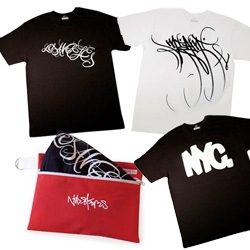 FEATURED3 limited edition t-shirts will be available at The Standard Hotels in LA, NYC, and Miami... Andre Balazs has commissione contemporary legends, Natas Kaupas, Eric Haze, and Jose Parla to design these t-shirts for their respective cities! 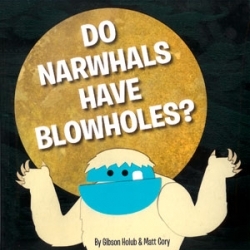 A fun and colorful children's book about two Yetis who go on an adventure to answer the burning question, "Do Narwhals Have Blowholes?" 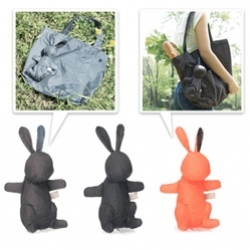 FEATUREDPicnica Reusable Tote ~ that stuffs into a bunny! And when you're using it, the bunny is attached to the side... hilarious, bizarre, and strangely appealing... definitely a standout design in the reusable shopping bag space! you can know what diseases you are most susceptible to, what your personality is like and your ancestry. All in tiny box from 23 and me. All you need to do is spit saliva and send it in. pretty darn cool. 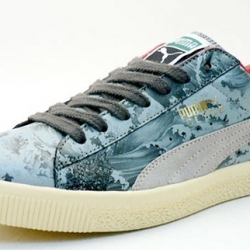 Genetics just got personal. 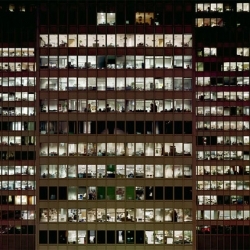 Fantastic photographic projects from swiss-born, Montreal-based Thomas Kneubuhler. 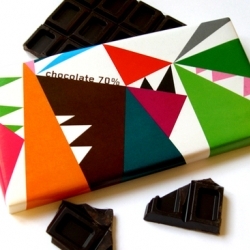 Sissi Edholm and Lisa Ullenius from Edholm Uilenius created this amazingly beautiful chocolate packaging for the gift shop in Museum of Modern Art in Stockholm. 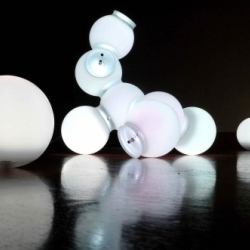 Nomad Light Molecule, designed by Maarten De Ceulaer. 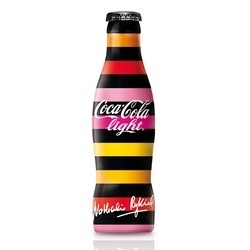 Another unique light design with the molecule atom shape where the light position is fully configurable - yes, you can change the shape of the light according to your taste. Which Jieldé are you? 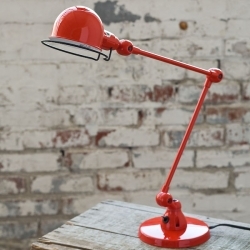 Originally designed in 1950 as the “indestructible” standard for work lamps, Jieldé lamps are now available as the perfect modern accent for any room! 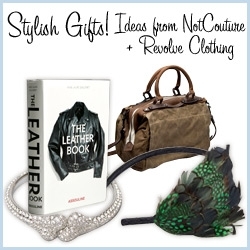 Check out the various styles and colors. 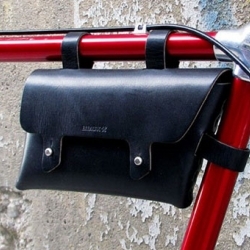 For all you fixed-gear aficionados this hand-stitched leather bike frame pouch from billy kirk should be on your wish list.